Do roaches send you into shivers? We totally understand. The pest is notorious for the grave problems it can cause to property and human health. From various allergies to serious diseases that can be only treated with "heavy duty" antibiotics, the grievous risks to your well-being, which a cockroach infestation can induce, should never be underestimated. Typically attracted to food preparation and storage areas or plumbing works in residential and commercial buildings, cockroaches will invade your property in no time by using their "superior" breeding and survival skills. They will contaminate every surface, fixture or item they touch and transfer various germs and bacteria to stuff that you use. They are disease vectors, trigger medical conditions, such as asthma, they damage goods, leave stains behind and emit unsavoury odours. In this guide, we'll explore everything you need to know about cockroach infestations and how to battle them effectively. The UK is a home to four types of roaches, with the German and Oriental competing for the 'most popular'-award. However, in recent years, the American cockroach began to plague the island through the import of goods from the USA, as well. There's also the Brown banded cockroach, which can be sighted in certain areas of the country. So, let's find out where it is most likely for you to sight the Oriental, the German, the American and the Brown banded cockroaches, which are the most widespread species that have plagued the UK for years. The German cockroach is average in size, reaching about 1,5 cm in length. You can differentiate them from other roaches quite easily. They have two dark stripes on their light-brown thorax. You'll most likely spot them in your kitchen or bathroom, as they like being near food and water. The German cockroach reproduces fast, laying eggs all year round in their thousands. This type of roach is much larger than the German and grows up to 3 cm in size. It's black or dark brown in colour and loves breeding in cool, damp and dark places. You'll spot the Oriental cockroach in basements, sheds, garages, near pipeworks and drains. The pests feed on decomposing matter, so it's not uncommon to discover members of their colony foraging near rubbish or compost bins. They can also settle outdoors, in areas with overgrown vegetation or groundcover plants. The Oriental cockroach breeds at slower rates than the German one. As mentioned above, the American cockroach is not native to Britain. It's one of the largest species, reaching over 4 cm in size. The insect is red-brown in colour. It prefers humid conditions and it can be often found in sewers and near drains, as well as on the grounds of animal-rearing facilities, such as zoos and farms. Still, in search of food and water, the vermin will move to residential buildings, too. So, they can be spotted in bathrooms and kitchen areas. The female and her offspring can produce over 800 roaches in one year. The Brown banded cockroach is the least common type that can cause a roach infestation concern in the UK. Rather small in size (about 1 -1,5 cm), the insect is easily identifiable by its yellow-brown stripes across its abdomen, hence its name. The Brown banded cockroach prefers warm and humid environments. It can be sighted near heated electrical parts of various items, in garages, close to motor engines, etc. 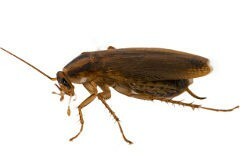 This type of roach feeds on stuff that has high content of starch. The insect is an average "reproducer", capable of giving life to around 600 specimens per year. What conditions do cockroaches prefer? In Britain, the common types of roaches prefer different environments. Some "feel" best in humid and hot places, whereas others like cool and damp conditions. One thing's for sure — all cockroaches avoid light. Hence, you'll rarely spot them out in the open during the day or scurrying around on your kitchen floor in broad daylight. 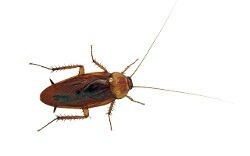 Roaches are creatures that seek the darkest and the most inconspicuous of places in domestic and commercial buildings. Therefore, you'll find them in out-of-reach spots, where they can thrive and reproduce in the most favourable settings for their particular type of species. Where clutter is, expect a colony of roaches, too. The insects love hiding places in rooms full of edible junk, be it old pet food, cardboard boxes, mouldy books, etc. The insects can survive without water for about a week but eventually, they will have to find and migrate to a water source. Furthermore, most of the warmth-loving cockroach species that are comfortable living outdoors will rush to settle in and continue to breed in your property, once the weather turns in. Sticky traps - this is a store-bought monitoring product - perfect for catching the health-hazardous pests. Once you get equipped with everything you need, investigate each area that is warm or near water and food sources around your property, including food storage rooms, the kitchen, the bathroom, around drains and pipes, the garage, the basement and so on. How to use sticky traps for monitoring: get yourself a sufficient number of this handy device and place them around in strategic spots - near likely entry/exit points, such as corners, cracks and spots where walls and floors join. These traps are quite effective and can reap results within 24 hours of installing them. For better management of the monitoring process, you can keep a record of the number of caught insects at each site. Furthermore, it’s a good idea to determine the whereabouts of the roaches by identifying various signs of their activity (faeces, egg cases, marks, stains, damaged goods and even live or dead specimens. 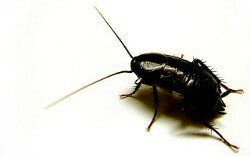 The faeces of a roach look like tiny black or brown rice grains and their size will depend on how large the insect is. Naturally, one or two miniature pallets of poop are invisible to the naked eye but a cluster of them should not remain unnoticed. Also, cockroaches may leave smear marks (a trail of droppings), which signal other roaches of the colony to follow towards a newly discovered source of food. The unpleasant insects emit a specific musty odour, which is strong and unsavoury. Furthermore, the oleic acid leaching out of a dead roach also releases quite a putrid smell. It warns others to avoid a spot that might be full of predators, such as your pet or to your misfortune, a family of rats. Whether you can identify the pungent smell or not is another matter, however. But for sure, a large population of cockroaches in your property will “notify” your nose in one way or another, be it through the excrements they leave behind in their numbers or because the crawlies have resorted to cannibalism due to lack of sufficient food sources. Eggs are carried in a light-brown egg case, which has an oval shape. Larger species carry larger egg cases, which may be easier to spot. The eggs contained in the case are often about 30 to 40 in number. The female will choose to lay and hatch its eggs somewhere warm, dark and out of reach. No, it’s not a beetle - the black bug that your cat is playing with. Pet felines are famous for finding roaches and getting the most of it in throwing them around until they stop moving, upside down. To distinguish a dead or alive cockroach from a harmless blackish beetle, remember that the latter have hardened forewings unlike roaches. Also, most beetles are not nocturnal creatures, so they won’t scatter around if surprised by the light being switched on all of a sudden. And if you wonder whether spotting one roach is a cause for concern - yes it is. Even if there’s no evidence of a full-blown infestation, yet, surely the onset of one is on the cards. The critters breed fast, as we’ve established, and can survive a nuclear war, they say. Cockroach control methods vary in their effectiveness and often to succeed in combating the problem, you need to call for professional help. Most over-the-counter insecticides, designed to kill cockroaches, may suppress the pest population but with limited results. Hence, a set of measures are always recommended, in order to eliminate the infestation. As mentioned earlier in our post, you can fit numerous sticky traps, which not only monitor the size of the colony but also reduce it. Still, our advice is to limit their access to food, water and shelter, and this way, prevent an infestation from developing in the first place, as well as ensure that the risk of recurrences in the future is brought to a minimum. Clean and sanitise - Keep rubbish bins tightly closed. Clean regularly all surfaces by vacuuming thoroughly food remnants from in between floorboards and underneath furniture. Keep your home in a good state of repair - Any pipe leaks or faulty fixtures in bathrooms and kitchens are an inviting water source for the pesky roaches. Store food securely - Food needs to be kept in airtight containers or in secure cupboards. This includes animal or pet food, as well. On that note, get into the habit to remove your dog's food and water bowls at night. Seal all possible points of entry - Cracks and crevices in baseboards, around cables and pipes, or spaces under doors are all possible entry points for the determined roach. 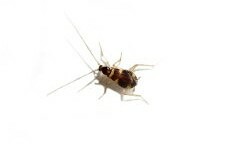 Ventilate and reduce moisture levels - It's well-documented that properties without an air-conditioning system or adequate ventilation in hot and humid climates are prone to cockroach infestations. Place a dehumidifier in susceptible places, such as basements and laundry rooms. Declutter - Clear away unused items, empty cardboard boxes, old equipment and disused furniture from any storage rooms in your property (the basement, the attic, the garage). Cut down garden vegetation - Some cockroach species happily thrive outdoors in overgrown areas and move in your house when the cold weather sets in. Get a cat - It may not help you kill an existing colony of roaches but a feline friend may deter the pest from settling in. A cat will also point at the problem by presenting you with a dead specimen as a gift. It may also direct you at the insects' hiding "headquarters", as long as you are observant enough to spot when your pet's hanging around and staring strangely at a small hole in the baseboard moulding. Well, it could be sensing a rat, of course, but that's is for another topic. Want professionals to deal with the roaches?